Approximate shipping weight 465 lbs. Height with optional casters is 80.75"
The Great Lakes advantage computer desks are built for maximum usability. The units are ruggedly constructed with heavy-duty steel to ensure strength and longevity. The storage drawers and overhead compartments are lockable, delivering critical security requirements. 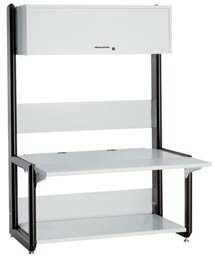 Many accessories can be added to the units including peninsulas, cable management solutions, and LCD flat-panel display mounts.